This week, the first turtle of the season clambered onto the beach just outside of TRACC to lay her many eggs. As we sat in the communal area, number 4, waiting for dinner we were alerted to unusual activity by the steady bark of the camp dog Monsoon. Curious about the barking Paul went out to check out the scene, triumphantly returning with news of turtle tracks just up the beach. 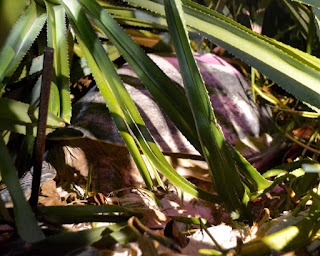 Equipped with red headlamps and the knowledge of Professor Steve, the camp went out to find a large, old and impressive green turtle well hidden beneath the spiky underbrush. 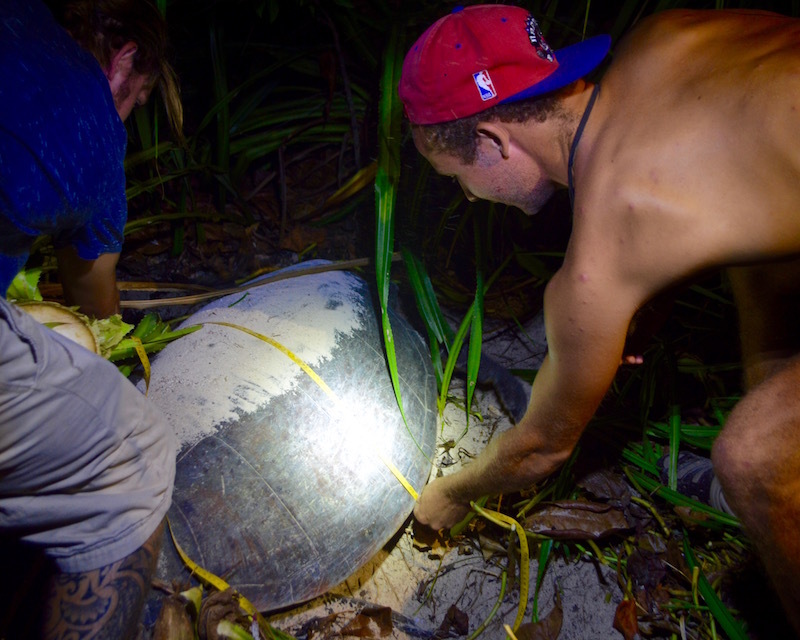 Turtles are aged through the length of the shell, with about 1-2 cm equaling 1 year, this one measuring 1 meter from shell tip to tip was a little less then 100 years old when accounting for her initial 2-4 cm hatchling shell. Oblivious, as most sea creatures are to red and green light as they have no need to distinguish between it at the depths they spend most of their lives where those colors don’t reach, we watched her under the red glow of a headlamp. The initial hole was dug with the front flippers with much crashing of undergrowth. The next stage was chambering where she dug a smaller hole at the bottom of the pit. Steadily she used one rear flipper then another rocking her body to and fro to dig her hole into the sand. She folded in the edges of her hind flippers to create a perfect bowl shaped shovel and continued the hard work of making a deeper nest. When she could no longer reach the bottom of her egg chamber, she moved to position her hind flippers over the hole. It’s usual for a turtle to lay between 80 and 100 eggs, 3-7 times each year and the range is thought to be between about 60 and 120. When satisfied with its size and depth, she began to lay her approximate 140 eggs in what we believe to be her first nest of the season. sand and brush over the nest with her front flippers, to hide the nest. 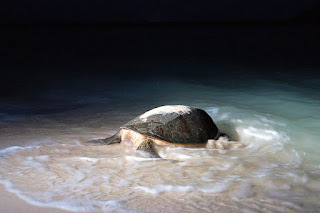 Becoming tired, she slowed more often to rest during this process, providing a chance for the A-level marine science students to practice some of their data collection skills and measure the turtles shell height and width – the standard measurements used to determine size and age. The resting period of our turtle friend also gave the team from Pom Pom resort, which has the official privilege to gather and safely incubate the eggs away from the danger of poachers and natural scavengers, a chance to begin collecting the eggs. Soon after she was satisfied her nest was safely hidden she turned around in the sandy underbrush, clumsy with her huge weight on land, and headed back to the ocean. Surprisingly quickly and steadily she made her way down the beach, shortened by the high tide she prefers for nesting, and entered to water. Its easy to imagine she must now be relieved to be back in the ocean where her 100 Land kilograms are lightened to what feels like 2, and she can gracefully and swiftly move through her underwater home. In about 2 weeks she will pick another evening high tide to revisit the beach within about 50 meters of her first nest and lay another nest of eggs. For now, her eggs lay safely protected and incubating on Pom Pom Island, and in about 60 days we will have the privilege of witnessing the hatchlings finding their way back into their watery home.